From Arizona to New York then Afghanistan and now Pennsylvania, Hassan Raza has had a long career full of travel and building expertise in transportation engineering. Hassan Raza, right, signs a memorandum of agreement with then-Delaware Department of Transportation Secretary Carolann Wicks. Raza joined PennDOT in 2017 as a standards and criteria engineer, but he's been in the industry for 41 years, starting as a survey party chief and construction engineer at the Arizona Department of Transportation. He then moved to New York, where he was a construction engineer with the New York City Transit Authority. In 1980, though, he began a 37-year career with the Federal Highway Administration. A self-proclaimed lover of travel, Raza says he had a "fascinating journey" with the FHWA, which took him to 13 states and three countries. He held a plethora of titles, including bridge engineer, resident engineer, planner, area engineer, design engineer and pavement engineer. He eventually worked his way to becoming a Division Administrator for five years in Delaware and Maryland. "Although a DA position in FHWA is considered highly desirable and few would want to leave that, my desire for change and travel was still intact," he explains. So, Raza volunteered for a senior highway and motor career advisor position at the U.S. Embassy in Kabul, Afghanistan. "It was a 13-month assignment that had all the excitement, uncertainty, professional challenges, long working hours, and opportunities to make a defining difference." Hassan Raza meets with the chief engineer of the Kuwait Ministry of Public Works in 1990. 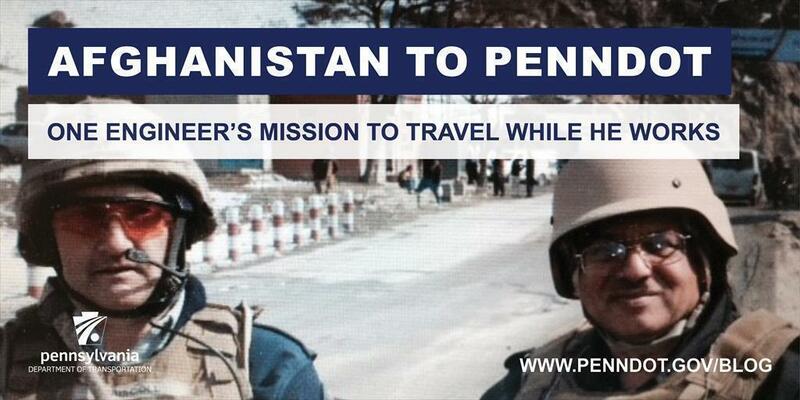 When he returned from Afghanistan, Raza was assigned to an assistant director of field services position. But after three years in that job, he decided it was time to do something different that provided hands-on work. That's when he became part of the PennDOT family. At PennDOT, Raza is responsible for maintaining and updating the Roadway Construction (RC) Standards and associated design manuals and publications. He is assisting the department with meeting federal requirements to update all safety hardware, such as guiderail, in our standards to meet the new Manual for Assessing Safety Hardware (MASH) testing requirements. Raza has quickly become the department's guiderail expert, even spearheading a "Guiderail Mentors" group that meets quarterly to share best practices and other information. In turn, the mentors serve as a source of knowledge and guidance for staff within their respective districts. "During this 41-year journey, where I have been fortunate to experience complex and challenging programs and projects, I also had much fun," Raza says. He plans to continue that excitement at PennDOT, where his leadership and knowledge are invaluable resources. To learn more about employment at PennDOT, visit www.penndot.gov/jobs.